11 DAY, 10 NIGHT GOURMET WINE, FOOD AND CULTURE TOUR to SPAIN! 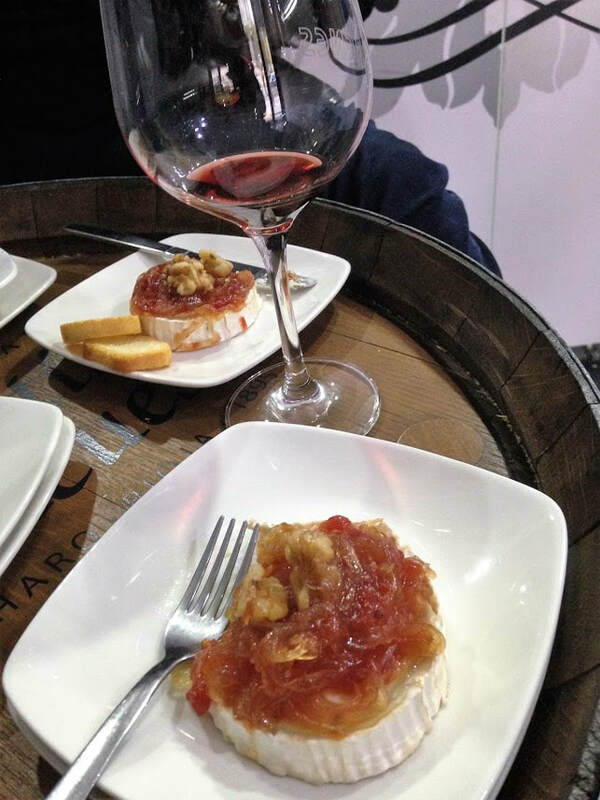 ​Our small group tour (maximum 18 guests) is the perfect way to experience Spanish wine, gastronomy and culture. Travel will be by comfortable coach with a bi-lingual Spanish and English speaking driver and tour assistant. 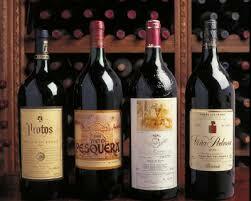 We will visit bodegas that produce wines from Spain's greatest regions: Ribera de Duero, Rioja, Penedés and Priorat. We will explore the art of Spain, from the gothic cathedral in Burgos, to Gaudy's great La Sagrada Familia in Barcelona, to the new Guggenheim Museum in Bilbao; and walk through centuries of history made famous in poetry, cinema, and literature. 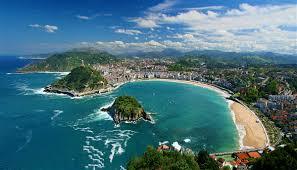 Through it all we will enjoy the world famous cuisine of northern Spain. Depart on Friday, September 7 for arrival in Madrid on Saturday, September 8. For those who wish to arrive in Spain early, we can arrange accommodations and options for things to do and see in Madrid before the beginning of our tour. It is a great way to get past jet lag and see more of Spain's Capital City. 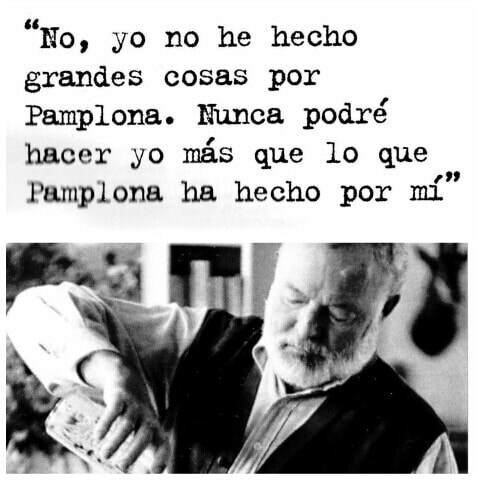 Saturday September 8: Arrive in Madrid. We will arrange airport transfers and transportation to our hotel. Rest until dinner, or join me on a walk for an introduction to the city and to Spanish culture. 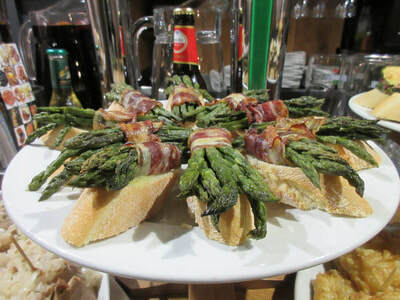 We will meet for a Tapas dinner in the historic center of Madrid. 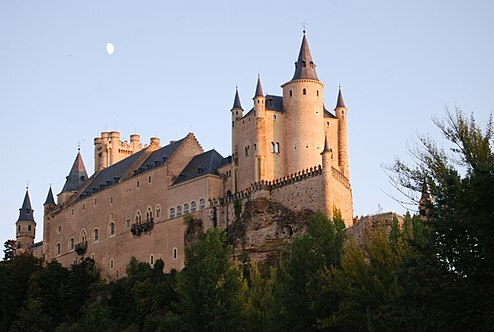 Sunday September 9: After breakfast at our hotel, we will board our bus at 10 am for the drive to Segovia to visit the famous Alcazar fortress, and the incredible Roman aqueduct that bisects the center of the city. We will lunch in Segovia on the traditional suckling pig cooked in a wood fired oven. 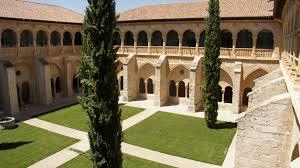 ​Then on to Ribera del Duero, one of the top 3 wine regions of Spain, for a winery visit followed by checking in to the 5 star Monasterio Santa Maria de Valbuena Hotel and Spa, one of the best preserved Cistercian monasteries of the 12th century. 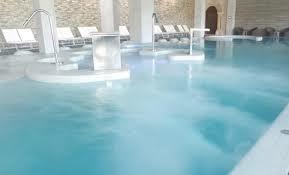 Our visit includes one day use of the thermal pools, so be sure and bring your swim suit! 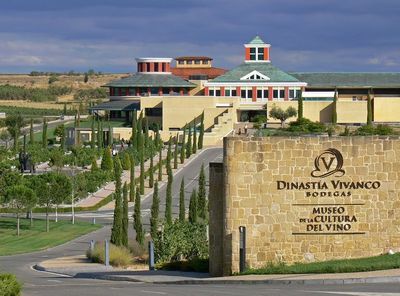 Monday September 10: After breakfast at our hotel, we will visit two wineries: one a historic family owned bodega producing traditional Ribera wines aged in hand hewn cellars dug deep into the hillsides in the 16th century; and a much newer winery whose wines represent a more modern style . Taste the difference, and see which you prefer! 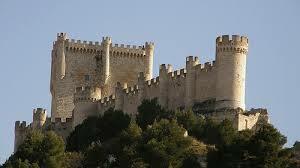 To round out the day we will drive to Penafiel to see the midieval town and castle. 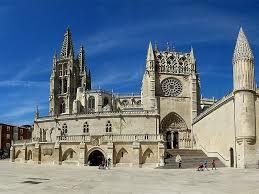 Tuesday September 11: After breakfast at our hotel, we head to Burgos to visit the UNESCO World Heritage Site, Our Lady of Burgos Cathedral. 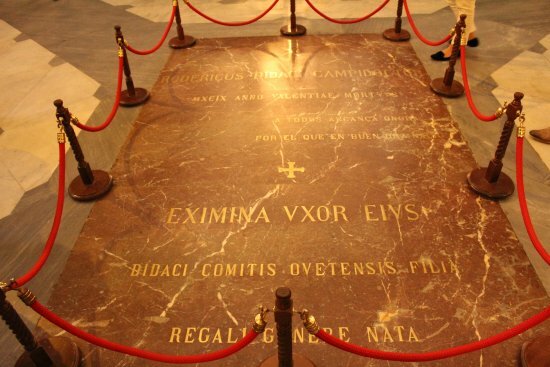 It is known for its spectacular art, and is the burial place of Spanish warrier and folk hero El Cid. 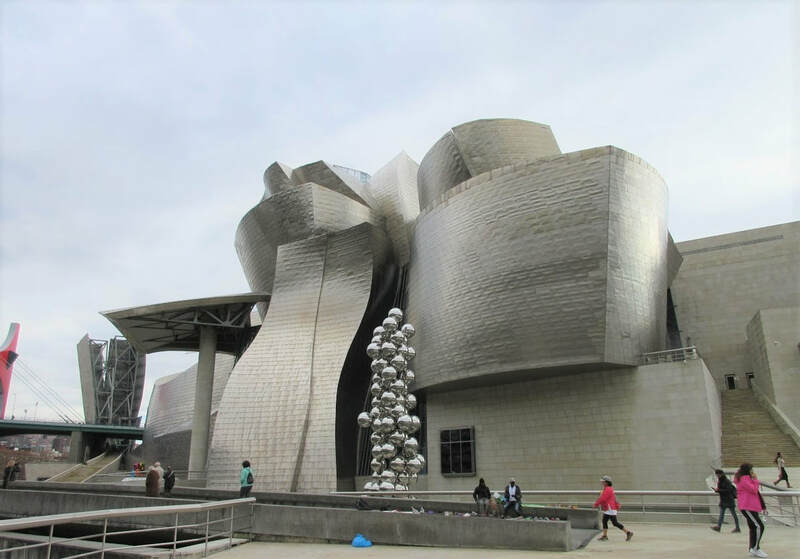 Then on to Bilbao, where we will lunch at the Guggenheim Museum designed by Frank Gehry, considered one of the most innovative modern buildings in Spain. 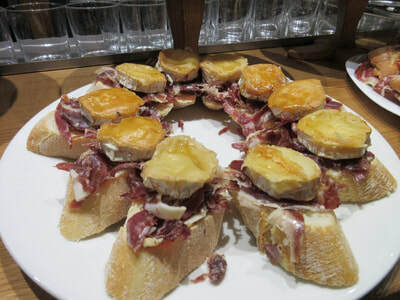 ​After visiting the museum, we continue to San Sebastian: a lovely seaside resort known for fabulous beaches, world class cuisine (especially its Basque version of tapas called Pintxos) and the largest concentration of bars in the world (at least according to Lonely Planet!) Pintxos anyone? Wednesday Sept 12: After all that traveling and touring, it's time for a play day! Is cooking your thing? Then after breakfast at the hotel, join us for an optional morning cooking class and learn about Basque cuisine. 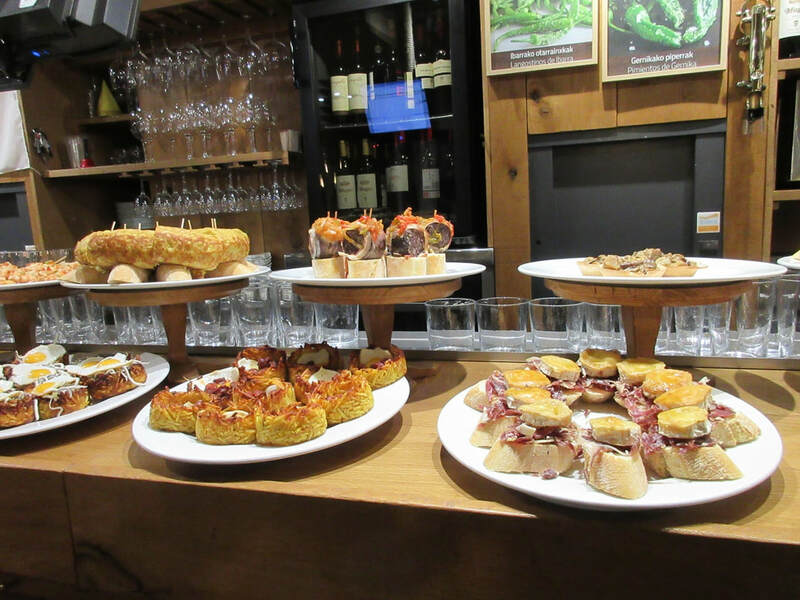 If cooking is not your thing, the beautiful September weather is great for shopping the boutiques, visiting the beach, exploring the Basque museum, strolling the Parte Vieja (Old Town) sampling pinxos and checking out the bar scene, or all of the above. We'll make sure you are well supplied with walking maps and points of interest to check out. Thursday September 13: After breakfast at our hotel, we depart San Sebastian for Pamplona, site of the the Running of the Bulls during the Festival of San Fermin in July. 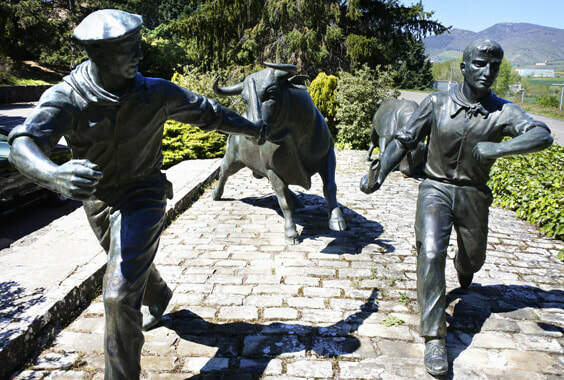 The Running of the Bulls was made internationally famous by Ernest Hemmingway in his novel The Sun Also Rises. After lunch and a guided visit of the town, we continue on to Rioja, another of the three top wine regions of Spain. When phylloxera, an insect inadvertantly imported from the American east coast, destroyed the vineyards of Bordeaux, French winemakers came to Rioja to make wine and import it into France. They brought with them modern winemaking technology and vastly improved the local wines. 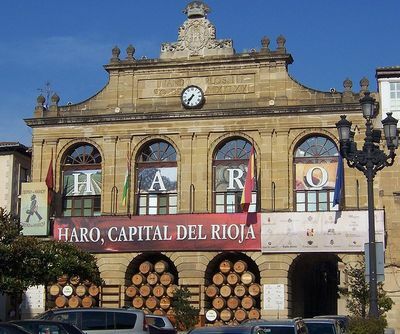 Producers built wineries around the rail head in the town of Haro, and so much money flooded into the region that Haro was the first city in Spain to install electric lights. 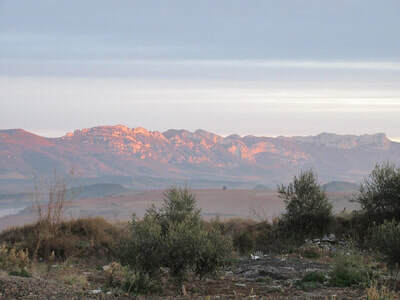 We will visit the first of our Rioja wineries, and stroll through the walled midieval hilltop village of Laguardia. Under the stone paved streets of Laguardia are ancient subterranean bodegas, and above them are lovely old buildings and historic monuments, including the Gothic facade of the beautiful Santa Maria de los Reyes church from the 14th century. 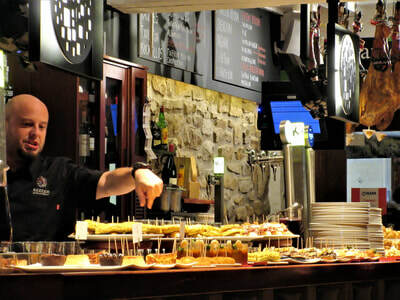 ​Then on to our hotel in Logrono- a town with an entire street dedicated to Tapas restaurants- perhaps the best Tapas street in Spain. Travel the street, ordering the specialty of the house and a glass of Rioja in each. You won't be able to sample the entire street in one evening- but we can come back tomorrow! 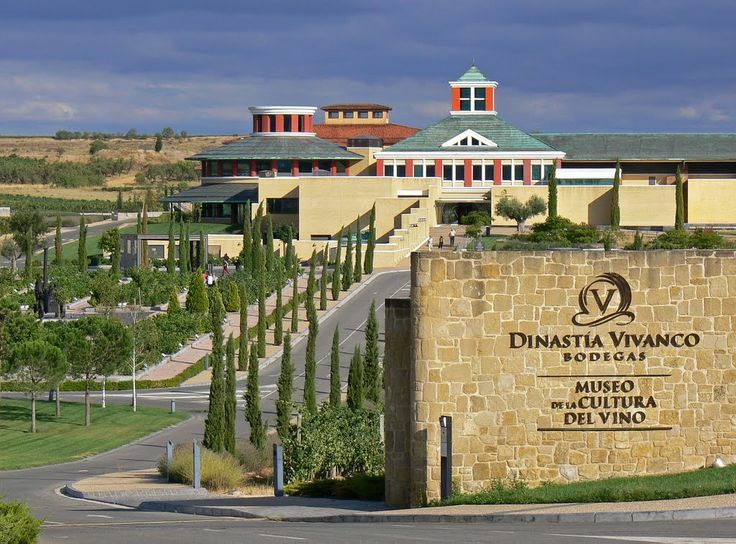 Friday September 14: ​After breakfast at our hotel, we will visit one of the best museums I have ever visited: the Wine Museum Dinastia Vivianco. Full of interactive exhibits and wonderful films that lead you through the history of wine and wine culture; the evolution of glass bottles; how cork was first transformed by hand into stoppers that could preserve wine, to how wine corks are manufactured today; the evolution of the art of making wine barrels; learning to detect aromas in wine, and many more. ​We will enjoy a traditional Riojan lunch. Local cuisine includes dishes such as potato or bean soup with chorizo , lamb chops grilled over sarmientos (dry grape vine branches) giving them a unique and delicious flavor, beef stew cooked with wine, cod with peppers and tomatoes to name just a few; and we will tour and tast wines at two of the magnificent wineries in this prestigeous region. Saturday September 15: After breakfast at our hotel, we depart Rioja for Barcelona, with a stop in Zaragoza to visit the town and have lunch. 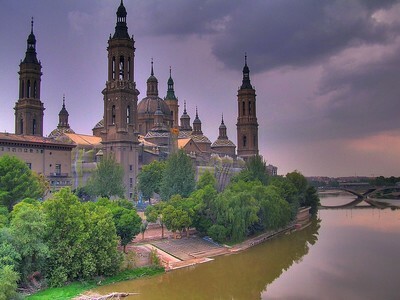 Zaragoza, the capital of Aragon, was founded by the Romans and has deep Islamic, Jewish and Christian roots. One of the most famous buildings in Zaragoza, the Basilica of Pilar is one of the key centers of pilgrimage in the Christian religion. The church has a pillar, which is said to have been placed there by the Virgin Mary. Pilgrims travel from all over the world to kiss the pillar and receive her blessings. The basilica is also home to some of the most beautiful paintings by Goya. 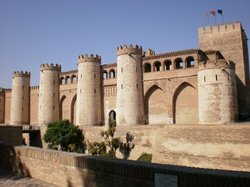 The Aljafería Palace is one of the most important Moorish palaces in Spain and currently houses the parliament of Aragon. ​Judaism also has very strong roots in Aragon, and Zaragoza was its epicenter. 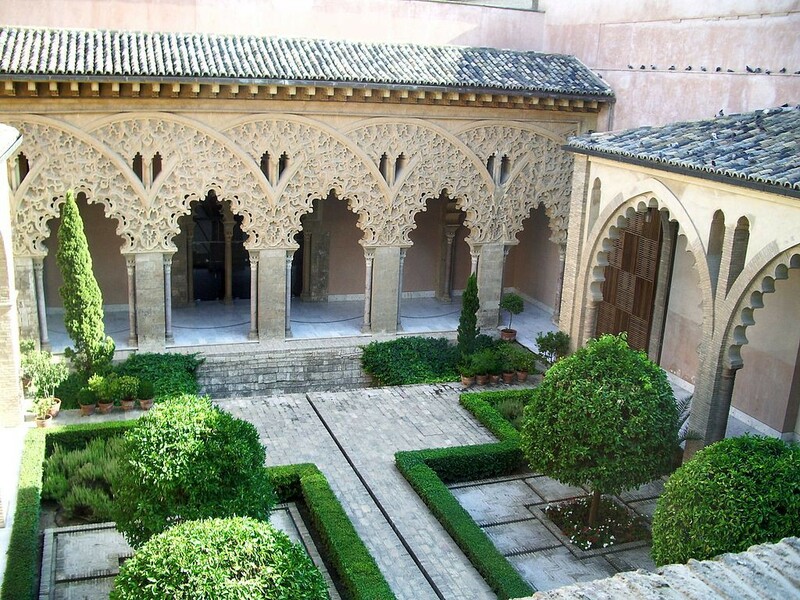 Unlike most of the rest of Spain, the Jewish, Islamic and Christian communities fluorished together. When Jews were expelled from Sevilla, Barcelona and Valencia, many settled in Zaragoza. This came to an end with the Spanish Inquisition, when most of the Jewish population was expelled and many of the buildings in the two Jewish quarters were razed. ​Next we depart Zaragoza for Barcelona and check into our hotel. Sunday September 16: After breakfast at our hotel, we will tour some of the high spots of Barcelona, including the famed Sagrada Familia. After a paella lunch, we have the afternoon and evening free to explore this amazing city. Monday September 17: After breakfast at our hotel, we drive to Penedes, home of Cava production, where we will visit Pares Balta, a fully biodynamic producer of Cavas and still wines from Penedes, and luscious full bodied reds in Priorat. After a late Catalan lunch, we return to Barcelona to explore. Tuesday September 18: Breakfast at our hotel, airport transfer, and the end of our Tour. Ten nights accommodation with breakfast, double occupancy. Rooms are standard double rooms, with twin beds available upon request. Monument entrance fees, as per itinerary. Entrance ticket to Burgos Cathedral, Wine Culture Museum Dinastia Vivanco, Guggenheim Museum and Sagrada Familia. What is not included: Airfare, hotel expenses like mini bar, room service, laundry, telephone, and expenses of a personal nature, cancellation insurance, health insurance. We strongly recommend that you purchase trip cancellation and health insurance. Medical costs for non-residents are quite high in Spain and even minor accidents can result in significant expense. Medical evacuation, if needed, can cost thousands of dollars. A deposit of $500 will hold your place on the tour. Optional Bonus Days: go South! Add the vibrant city of Tarragona with its Cathedral, Museum of Roman Antiquities, a spectacular aqueduct, the remains of the Roman forum and well preserved ampitheater overlooking the Mediterranean, lovely parks and gardens, and stunning beaches; visit Priorat, one of the three highest quality wine producing region in Spain along with Rioja and Ribera del Duero; then on to Valencia, home of Paella, with its Cathedral which claims to hold the Holy Grail, the cup used by Jesus in the Last Supper, and which certainly does contain 2 paintings by Goya; a fabulous Central Market; unspoiled beaches; and the futuristic City of Arts and Sciences. Finally, back to Madrid for one final night and a flight home the next morning. Approx. 5 days with 2 nights in Tarragona, two nights in Valencia, and a final night in Madrid. Cost of the bonus days will depend on the number of people who wish to participate since transportation is a major portion of the cost. Rutas de Vino, our ground agency, can quote prices for as few as two guests or for as many as want to participate. Let us know if you are interested in optional bonus days.